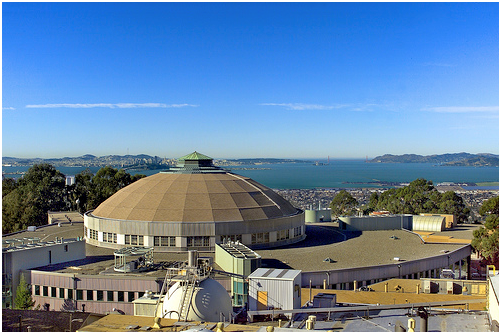 The Advanced Light Source (ALS) at Lawrence Berkeley National Lab (LBNL) in California is a particle accelerator that generates bright beams of light for purposes of scientific research. On the electromagnetic spectrum, the light produced by the ALS is one billion times brighter than the sun. A third-generation synchrotron, the ALS is a specialized facility that uses beams of x-rays for a broad spectrum of advanced research in fields such as biology, chemistry, physics, and energy. This advanced research is conducted by accelerating a hair-thin beam of electrons down a linear accelerator and into a booster ring where they ultimately reach speeds nearly equal to the speed of light. These electrons are then guided into a holding pattern maintained in a 200-meter storage ring using a complex array of magnets. X-ray light emitted in this process can be diverted and directed down beamlines to experiment end stations and utilized for research purposes. Behind the scenes, a team of highly trained engineers and technicians works diligently to maintain the facility. Maintaining an accelerator ring 60 meters across in a facility nearly on top of the San Andreas Fault is no small feat—only the best in metrology equipment and software will serve. The engineers at the ALS have been using SpatialAnalyzer® (SA) with a variety of portable metrology instruments since 2006. They use SA for all 3D surveying, part inspection, routine alignment processes, inspections, and a complete survey of the accelerator storage ring once a year. As in any research and industrial facility, down time must be kept to an absolute minimum. The faster the surveys of the accelerator storage ring can be completed, the better; however, a high level of accuracy must be maintained for the facility to function properly. 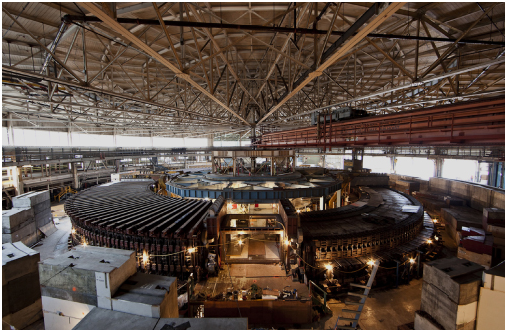 The biggest job facing the metrology group is the annual survey of the entire storage ring. Measuring the exterior of the ring presents a major challenge because only a small section of the ring is visible from any one instrument location. The storage ring is 60 meters across, so trackers are used for long-distance cross shots to accommodate the distance requirements. A monument network is laid out and used for instrument alignment and constraint along the horizontal axes. A full set of measurements with approximately 2,000 points is the result of 60 laser tracker stations, including detailed elevation measurements provided by the digital levels. Measuring the interior of the ring is less complex for the simple fact that a greater extent of the accelerator is visible from a single location. Pre-mounted SMR nests are located on numerous points on each magnet section inside the ring. At each instrument station, a ½ SMR is set in each of the associated nests and an auto-measure routine in SA drives the instrument to point at each SMR and captures the points automatically. When a routine is complete, the SMRs are collected, the tracker is moved, and the process is repeated until the entire interior of the ring has been measured. One key SA feature that helps the ALS crew is the Unified Spatial Metrology Network (USMN). 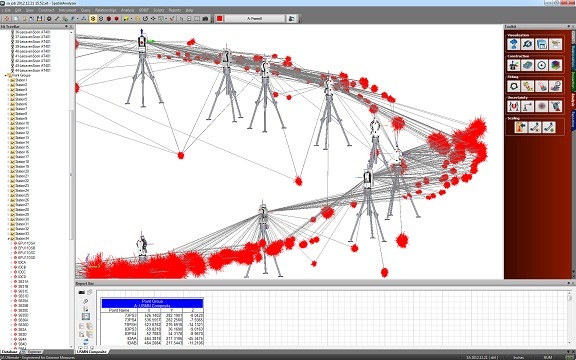 With USMN, users can bundle instruments within a network and leverage the uncertainty characteristics of different instruments to improve the accuracy of the instrument network. It provides a complete network adjustment of all the stations and targets simultaneously, which enables it to produce the optimal alignment for the network. USMN not only derives optimal point coordinates from the measurements, but also plays an important role in documenting the measurement uncertainties and delivering traceable results. Shifting from theodolite-based measurements to tracker-run measurements in SA has reduced the yearly accelerator ring survey time from three weeks to three days. Doing so has also improved the efficiency and accuracy of routine measurements throughout the facility. The use of SA’s Measurement Plan feature has improved efficiencies even further by helping automate parts of the survey process, saving several minutes at each tracker set-up. Reducing set-up time by several minutes at 60 stations adds up quickly and amounts to significant time savings.